Manufacturers have customized training options. As technologies change and work forces age manufacturing companies have an ongoing demand for highly trained workers that are up to speed with new skills. Employers in maritime, aerospace, composite materials and advanced manufacturing work in partnership with Washington State’s extensive community college and technical school system to develop customized training programs to meet their workforce needs. 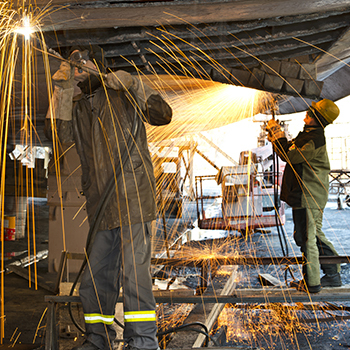 Maritime training includes welding, fabrication, marine propulsion and engineering along with on-deck maritime skills. Read more about maritime workforce training in the SeattleTimes. The maritime industry employs 148,000 and generates about $15.2 billion in revenue. 80% of all luxury yachts are built in Washington State. In the aerospace sector, over 1,350 companies employ 132,500 highly trained workers and more than 1,300 commercial, military aircraft and unmanned aerial systems are produced annually. The technical and professional skills required to keep these manufacturing sectors on the cutting edge is possible because of their close relationship with Washington’s community and technical college system.